Send Bulk SMS Software for Pocket PC establish communication with your business partners by sending bulk sms directly from Pocket PC or PDA devices. Software is capable to send text messages from Windows OS based mobile phones to all GSM and CDMA cellular phones. Messaging program facilitates user to easily make contact with their family members, friends, employees, customers and business partners living at any part of the world. Bulk sms software is an important tool for enterprises to promote products and services of companies’ in most convenient way by quickly reaching the target clients in short time span. Utility does not require any external device (Desktop/Laptop) or internet connection for sending text messages. Mobile messaging program supports all major windows OS based pocket PC mobile manufacturers including Samsung, HTC, Motorola, Toshiba, Nokia, LG, HP and other popular brands. Step1 : Click on “Load Contacts File” button to load recipient number list. 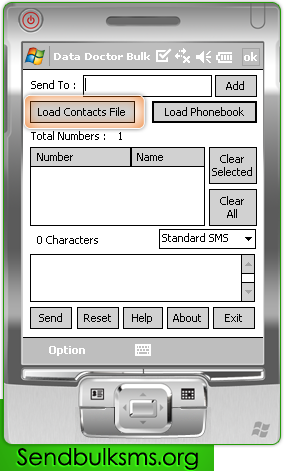 Sends text messages directly from Pocket PC to user`s mobile phones. Delivers group SMS to any volume of people without requiring internet gateway. Broadcast mass messages to all national and international mobile phone networks. Facility to record sent message history with date and time. Instant delivery of unlimited text messages like advertising products, share market news, job alert notification, meeting schedule, promoting services and other business messages. Interactive and friendly GUI interface makes easy for common mobile users to understand software features and functionality.